I’m slowly getting the hang of being Horde. No longer do I instinctively head for the Alliance quarter of Dalaran when I leave the Violet Citadel and I’m coming to terms with the Battleground maps being the wrong way around. Although I keep saying Stables when I really mean the Farm and vice versa. The level of communication on the Horde side of my new Battlegroup has amazed me. Virtually every single game I’ve played, people have spoken and not just the usual “LOL WE LOSE” spam. Perhaps I’ve just got lucky so far, but it’s looking good so far. I miss the Beer Garden though and the Filthy Animal is taking a bit of getting used to. Orcs throwing knives at the wall and wolves on the floor isn’t quite what Erinys is used to. I hate this lull period before expansions. It feels as if I’m in limbo. Because not all the guild can afford to transfer, we can’t manage to field a full 25 ourselves which means pugging whilst waiting for people to level up/find the cash. That means raiding is a bit hit and miss at the moment. On top of that, I really like time frames and lists. I hate not knowing when Cataclysm and it’s precursor patches are going come. Do we have one month, two, three, four before everything changes? This is also effecting my “writing”, although I use the term loosely. Half the things I was planning on talking about will change as soon as Cataclysm comes crashing through the door and I don’t really want to write about beta/ptr changes because they are still in flux too much. Healing changes seem to come with every little patch so pouring out venom/getting excited now seems a little premature. That said, Holy is shaping up okay I think. We just need a few more choices in our primary tree and then it could close to perfect. Having more options in the secondary trees than we do in main tree is wrong and needs fixing though. Pet hates, I have a new one. People who queue for dungeons through the random system and then go afk. If it’s a crisis, leave the queue please. I know leaving people hanging for 30 seconds or so is hardly a major crime but I find it really frustrating. However, if they have no legitimate excuse like small children, emergency phone calls, animals throwing up or a house fire, I’d like to borrow the Murloc Parliament’s Bee Pit. Maybe being stung by a thousand angry bees would wake them up enough so that they manage to click accept in future. Although there are probably more people than bees in said pit at the moment. Just a jump to the left and a step to the right and a picture can look completely different. 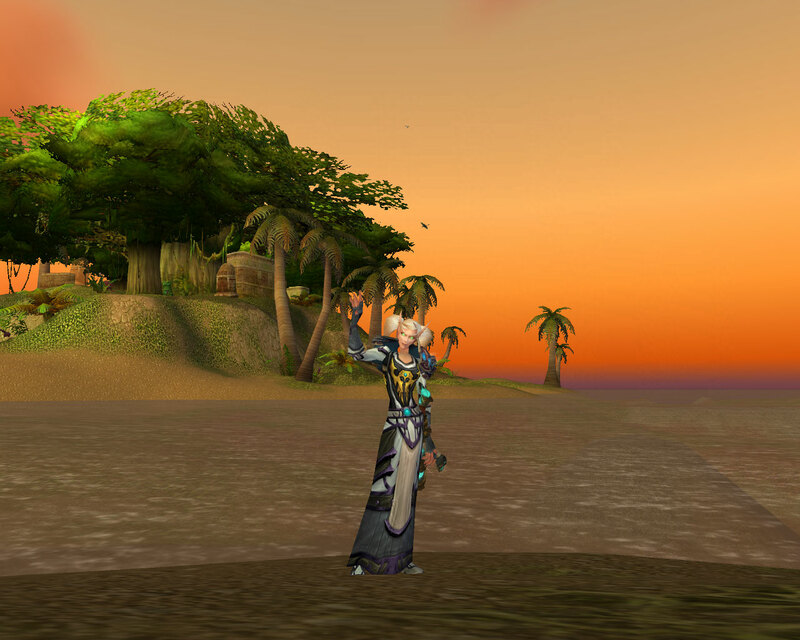 I think that’s one of the things I love about WoW, the way the light changes, completely altering a scene. The more I think about it, the more it seems that I’ve always been destined for the Horde. 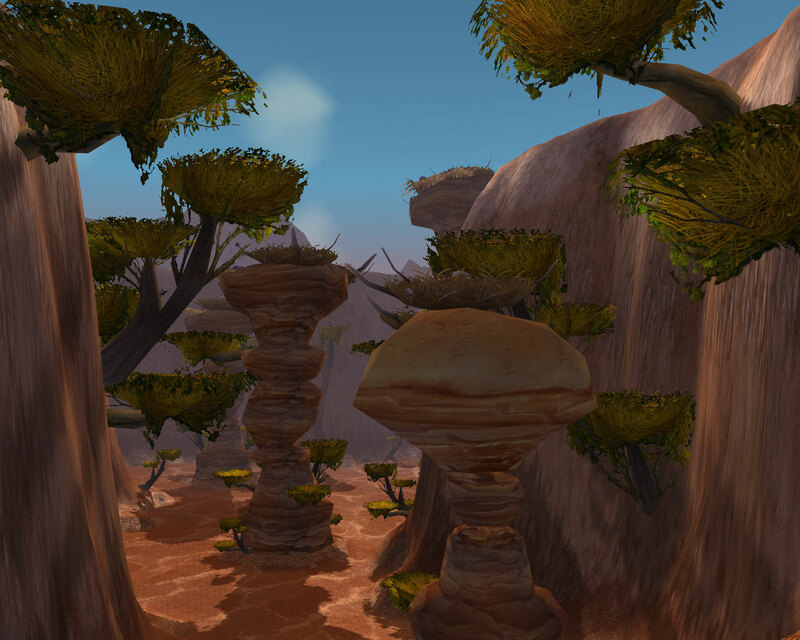 Most of my favourite looking zones have been historically Horde ones, Thousand Needles, Silverpine Forest, Mulgore, Ghostlands, Eversong Woods and the Barrens. Whilst helping clear up an infestation of the Cult of the Dammed in Dragonblight, I came across this helpful book. Chapter 3 sounds particularly interesting. Imagine dying in Outlands and attempting to find a coffin to match your clown suit. Although given that the Necromancers all seem to wear minor variations on black, purple and black, I wouldn’t have thought finding a matching coffin would be at all hard for them. I can’t help wondering what sort of modern conveniences today’s scourge look for in their coffins though. A coffee machine perhaps for those early starts on cold winter mornings? A panic button in case you get nailed inside by angry villagers waving pitchforks and torches? A fluffy blanket to cuddle when the Lich King says nasty things to you? The possibilities are endless. 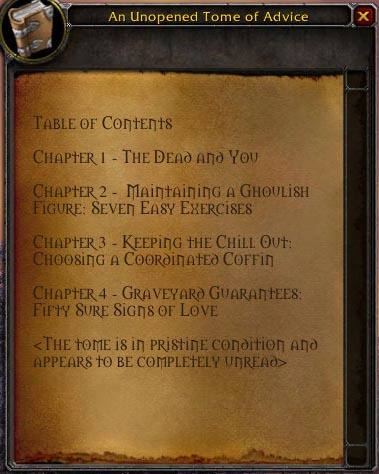 As for chapter 4, maybe those “frigid” necromancers would be a little less frigid if they read that particular section. Does romance with the Undead add a whole new meaning to jawdropping? Besides how can you tell if a walking corpse loves you so? I doubt very much that its in his kiss. This book should be crucial reading for everyone. Wouldn’t you want to know if that Undead currently eating your face is coming on to you or just regressing into “braaaiiiiiiiiinnnnnnsssssss” zombiemode? Who knows, the necromancer I “liberated” this copy from might have survived had he or she actually read the book. Failing that, they could have tried to hit me with it. I imagine it to be a very large and very heavy tome, the sort that if dropped on your toes turns them blue black and bruised in minutes. In a complete reversal of fortunes since the Midsummer Fire Festival, my keg shaped treasure chest does indeed seem to be filled with treasure. With more than a week to go, I’ve already secured a mole machine and a Brewfest Kodo (although ungrateful as it seems, I can’t help wishing it was a ram) on my priest. 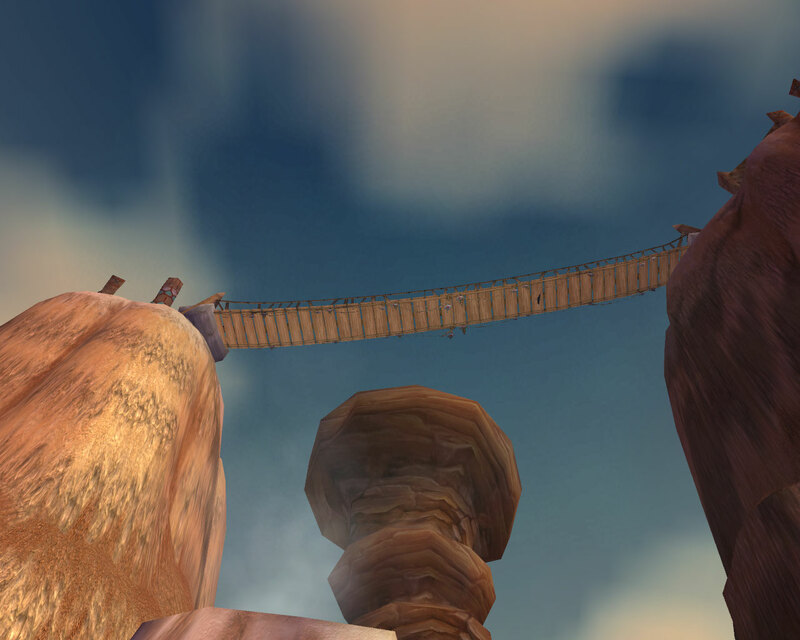 Whilst I do love Brewfest, primarily due to the ram racing, a couple of things have bugged me this year. Up first is how ridiculously easy Coren Direbrew is. I feel bad signing up as a healer because I’ve yet to meet a group who needed any healing. As it stands, I shove a shield on the tank and then get down to practising for cataclysm, smite, smite, smite, smite. I had a vague recollection from previous years that he spawns some dark iron girls who throw beer at you, but haven’t seen them this year at all. I suppose deep down I just have this feeling that a “boss” who hands over the current top tier of badges should be a little harder than this. That isn’t even our best time. My Boomkin managed to knock a second or two off that whilst “accidentally” aggroing half the bar at the same time. Starfall and small spaces really doesn’t mix well. Then there is the mysterious case of the vanishing quests on the EU servers. Like last year, both the shooting pink elekks and capturing Wolpertingers have been removed. You buy your mini-pet from the vendor for 50 silver (the price goes down with faction discounts) and as for the pink elekks and the forty tokens it’s worth, well tough. I tracked down a blue response from last year and I must admit it’s left me surprised in two regards. Firstly that if anyone was going to have issues with the game, it would be people killing and netting small animals whilst drunk that caused the problem. Not poisoning people, not killing animals whilst sober, not kidnapping, nor torturing and not committing wholesale murder, but shooting pink elekks whilst drunk. There are plenty of other things in-game which involve getting drunk and yet they don’t seem to fall foul of any legislation, drinking for a stamina buff (rumsey rum) springs to mind, the Brew of the Month club and so on. In fact the filled festive mug is surely far more dangerous to impressionable minds as it allows you to slowfall off mountains whilst drinking but that’s obviously deemed ok. The other issue I have is that, knowing they can’t have these particular quests in Europe, they’ve done nothing to change the quests so that they would be acceptable here, meaning that we lose out in terms of tokens again. Although I suppose that shouldn’t surprise me in the slightest. All that said, it’s still one of my favourite holidays. Cheers! Even the most grizzled and bad tempered of pirates would have been impressed with the carnage taking place in Booty Bay on my server. There was drinking, plundering and plenty of fighting, in the Inn, on the roof tops, in the water and along the dock. Anywhere in fact that two or more people of opposing factions could fit. I rather like the costumes too, as shown below on mine and Mr Harpy’s warlocks. I know there isn’t much to Pirate’s Day, but it’s pvp opportunities and costumes definitely make it worth doing in my book. Fifty pirates chasing each other around Booty Bay adds quite a surreal feel to the place. 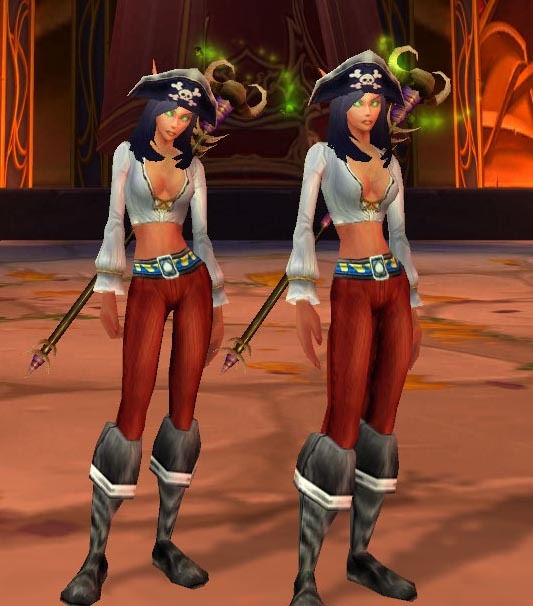 The fact that the UI was showing everyone wearing a pirate hat regardless of whether or not they are in disguise is a nice touch too. One of my goals that I desperately wanted to complete before Cataclysm came around was to finish the Wrathgate and the Battle for Undercity on a horde character. 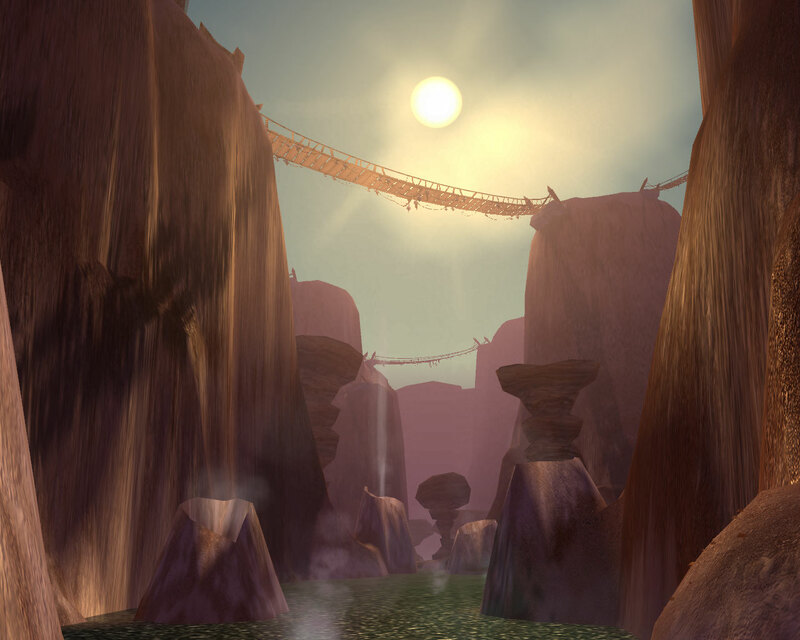 So once I was settled into my new life as a Bloodelf, I headed off to Dragonblight to track down the horde version of the chain. I’ve always felt bad during the Wrathgate cinematic but this time it was far worse because I’d helped them make and distribute this weapon of mass destruction. I’d played a crucial part in helping the bad guys be bad. I knew it melted people, after all I’d seen it in action at Dragonblight when the poor junior apothecary became a puddle of green goo and I still handed it over without a care in the world. So watching the consequences of my actions made it far more painful than merely being a spectator to a horrible event. Saved from a fate worse than death!!!!! Unfortunately or perhaps fortunately, he respawns really fast so we didn’t save him from anything but the thought was there. The other major difference was that I ended the chain feeling that the Horde have a clearer sense of identity. Regardless of your race, Thrall is the Warchief, Thrall is the leader of the Horde. Sure, the Orcs are pushing their warrior culture on the other races as shown through the quests, but swearing loyalty to one figure helps create a sense of unity. If you ask a Nightelf, a Gnome and a Dwarf who their leader is, you’ll probably get three different answers and none of them would be Varian Wyrnn. Ask the same question of three members of the Horde and it’s likely that regardless of their race, Thrall would be mentioned. I’m not saying that everything in the Horde garden is rosy, far from it and the tensions which already exist are most definitely going to get worse but I loved the quests where you had to get the Taunka to join the Horde. It was easy to imagine my Bloodelf at point in her past had uttered those same words as she took the same oath which made the quest feel a little more personal. Also Thrall owns. Why doesn’t my shaman have all those awesome tricks? I’d rather fight with Thrall, the classic 31/31/31 shaman at my back than Varian Wyrnn. Is there anything Thrall can’t do, if moving mountains and clearing up plagues present no problems. 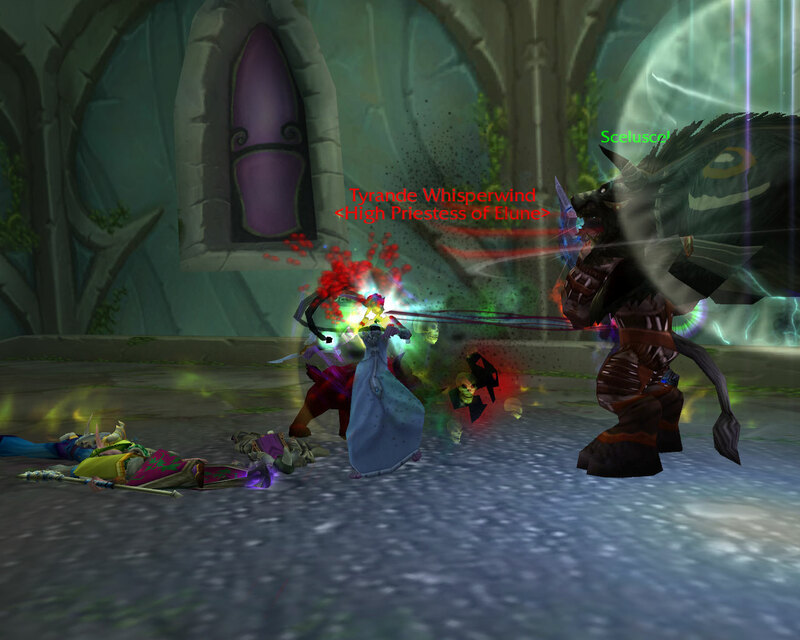 The biggest failing of the Battle of Undercity has to be that once we won, someone went and put the elevators back in. Surely they could have come up with a safer option, even leaving the spikes there would have been better than putting the lifts of death back. Which leads to my final point, I can see my journey ending with the Horde. Already I’m seduced by war drums and the cries of “Lok’tar Ogar”. 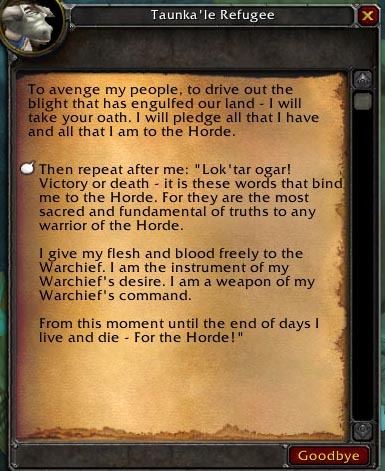 I suspect I too will live and die – For the Horde! It’s well worth seeing the chain from the other side and remember, the Battle for Undercity is going away with Cataclysm, so if you want to see how the other faction does it, your time is running out. First of all, sorry Lord Byron for the borrowing and paraphrasing of your work and secondly, I’m a turncoat. No longer is Erinys a Priestess of Elune, instead I’ve betrayed everything she stood for. The core of my old guild, the one which disbanded the day after getting a Tribute to Insanity decided that we should reform for the expansion. However there was one small snag, the majority wanted to go Horde. On the plus side, it means I might actually get to kill Arthas before the end of the world as we know it and when Cataclysm hits I will be raiding seriously again (which I knew I wanted). I transferred last night and whilst the transition phase is taking a bit of getting used to, it was definitely the right decision. Although the meanies made me do this within hours of my arrival on the darkside, for the Horde! I never realised just how annoying Magni Bronzebeard was to kill, especially when there are six of you and about four Alliance plus guards trying to stop you. In the end we had to kite him into a house and tank him on the second floor, that way we lost the guard spawn and we could leave the tank alone upstairs and go kill the attackers without having to worry about the boss. We also did some semi premade battlegrounds which got me all excited about the rated system. Playing as a team is so much more satisfying and having multiple dps trying to rescue from pesky rogues and deathknights is just awesome. 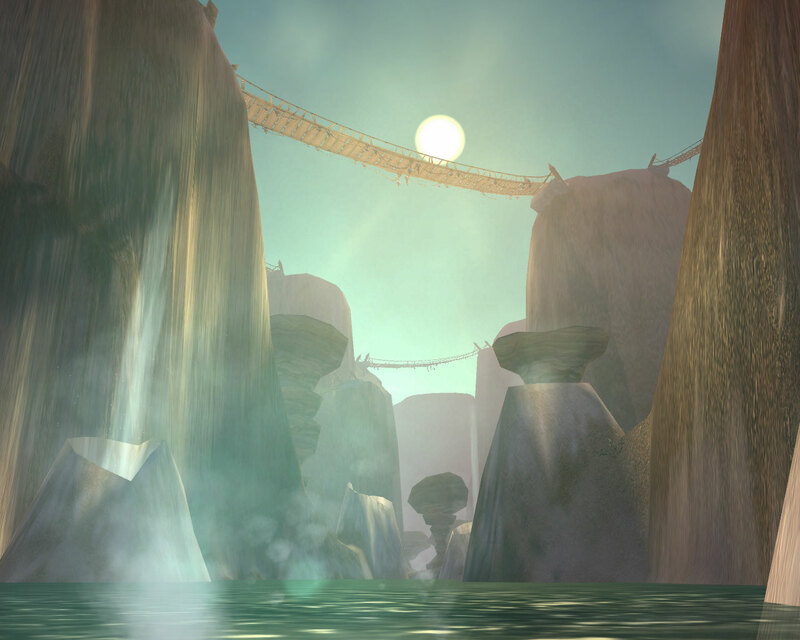 In a sense, ignoring the faction transfer, it feels like coming home.